This was another excellent talk by Maggie Simms which again fascinated and enthralled the Friends at the start of the 2018/19 season. Iraq is where the evidence for the worlds’ oldest cities lies. A succession of groups of people have competed to own it and each has left its mark. The ziggurat at Ur, of the Chaldeans, was built around four thousand years ago and surprisingly was recently ‘preserved’ by Saddam Hussein, he also instigated the use of a cable car at Babylon. It seems amazing that those last four words would ever appear in the same sentence. The land between the Tigris and Euphrates is also known as the ‘fertile crescent’ it is a vital piece of land that also glues the three continents of Africa, India and Europe together. As people shifted across the area there was also a shifting of ideas and practices. In the reign of the Ottoman Empire this area became known as Mesopotamia.. (Meso – middle, potus – water horse). This vast landscape is covered in archaeology, the ruins and artefacts are a great legacy of the people who lived there over thousands of years. Hill shaped mounds are sometimes evidence of a Tel, the Arabic word for hill. These were formed when the mud bricks crumbled and were stamped down in order for a rebuild to take place. A looming question then and now is who owned the oil. It is indeed ‘black gold’, the Mesopotamians used bitumen, a product of oil. The pitch or tar held buildings together as reed mats were soaked in tar which would harden between the layer of bricks and it was also used in boat building. Pitch was also highly valued in Mediaeval times by apothecaries. Some of us can remember that when the streets in Lancashire were repaired, coal tar was put between the cobbles and parents would urge children with coughs and colds to breathe in the fumes to ‘clear the lungs’. Do you also remember Coal Tar Soap? 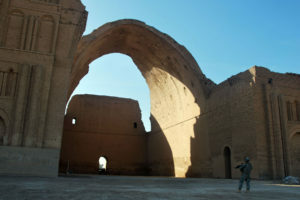 One nugget that emerged was that the Persian city of Ctesiphon built over 2,000 years ago, was the largest city in the world in the sixth and seventh centuries and held the biggest brick built arched structure in the world until the middle ages, the arch of Chosroes in the royal palace. Miraculously and without the intervention of trained architects it is still standing today. Will we be able to say the same of todays contemporary structures? Of course as Maggy reminded us, it is debatable when considering whose history is the right and proper history and whose past is the right and proper past. Isn’t it said that history is written by the victors? Societies in the fertile crescent were based along rivers, marshes and coastal areas. The reed boats they used for transport have not been found, however depictions of them on images and models do exist. They were leaf shaped boats that traversed the Persian Gulf. Maggy revealed that it was due to the efforts of Austin Henry Leyard a British ‘toff’ that established that Nineveh existed, it is said to be one of the greatest and oldest cities in antiquity. Leyard made friends with the locals and brought home cartloads of statues including dozens of carved slabs depicting the famed winged bulls and other sculputures. Some of which can be seen in the British Museum today in the fabulous galleries dedicated to Assyrian culture. ( An unmissable experience). It would seem that the world also owes a debt to Geoffrey Smith, an autodidact, who worked for free for the British Museum and in 1872 transcribed the complex and hugely difficult Flood Tablet. This wedge shaped block written in cuneiform around 1800 BCE caused a sensation when transcribed, Smith ran round the British Library when he discovered the key! This discovery was apparently responsible for stimulating a surge of interest in the Middle East. It is very intriguing how the same story appears in the Jewish Bible – Old Testament in 800BCE. 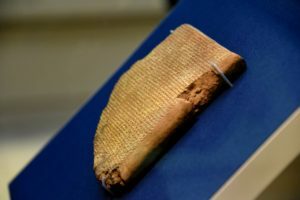 The tablet, in the British Museum, which was excavated by Hormuzd Rassam is from the Library of Ashurbanipal II at Nineveh, northern Mesopotamia, modern-day Iraq. It is apparently very small and innocuous looking for such a famed and far reaching story. Might it be the first written indication of climate change?. Tablet X1 of the Epic of Gilmagesh AKA ‘The Flood Tablet’. Attribution: Osama Skukir Muhammed Amin. Another fascinating nugget was the story of the reconstruction of the Ishtar Gate of Babylon by German archaeologists. They seemed to be amongst the first archaeologists to take the job seriously, making site plans before excavating. Apparently they found that the cobalt blue tiles lay in heaps as the mud bricks which they faced had turned to dust. Their painstaking work resulted in the stunning architectural panels in the Pergamon Museum in Berlin. Another must see. See also the banner image. Maggy informed us that Ur was occupied from 5,000 BCE until around 500 BCE. Obviously over these 4,000 years geological and natural forces of deposition have shifted the courses of rivers and pushed what were coastal areas sometimes as far as 7,300m inland. Archaeologists also owe a debt to Leonard Woolley, when he was excavating at Ur he looked at the soil strata in the walls of the pits and discerned discoloration, he was one of the first to discover this, archaeologists routinely look for strata discoloration today. He is also famed for his discovery of the artefacts in the huge royal death pits. 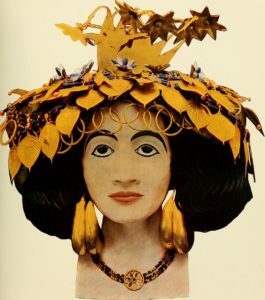 Puabi’s grave surrendered fabulously rich Sumerian headgear and necklaces that were fitted for a Queen. (Again in the BM and stunning to look at). A gruesome feature of these burials was the ‘retainer sacrifice’. Skeletons of servants were posed after death, which may have been from blunt force trauma to the back of the skull, let’s hope they were sedated first! Ur also gave up what is known as the Standard of Ur, demonstrating peace and plenty on one side and warfare on the other side. This was a most illuminating evening with someone who is clearly in command of her subject and who transferred her enthusiasm and delight to her audience, the supporting visual imagery also helped us to envisage the area and those times even further. That the Epic of Gilmagesh is one of the worlds most continuous narrated stories, it was already ancient when it was written down as one of the Old Babylonian tablets as was the Flood (or Deluge) Story aforementioned which is part of the Epic. That if you visit the Louvre you will be able to see the The Stele of the Vultures which among the first panels that depicts the first evidence of organized warfare along with the Royal Standard mentioned above. Banner Image: Part of the Ishtar Gate, Pergamonn Museum, Berlin. Date approximately 575 BCE. The 8th of 8 gates of the Inner City of Babylon. Erected by Nebuchadrezzar 605-575 BCE. Attribution:Etrick.